The Ming dynasty is known in Chinese as the Míng. [d] This is written as 明 in Chinese characters. The character is a sun (日) and a moon (月) together and means "bright". Chinese uses different words to talk about the different meanings of a Chinese "dynasty" in English: their government is called the Míng cháo (明朝), their country is called the Dà Míng dìguó (大明帝國 or 大明帝国), and their time in Chinese history is called the Míng dài (明代). Unlike in English, the name of the dynasty is not the same as the family name of the leaders. The family that led China during the Ming were the Zhūs. [d] This is written as 朱 in Chinese characters. Today, it's just a common Chinese family name, but it used to mean the kind of red coloring that you could make from cinnabar (HgS). 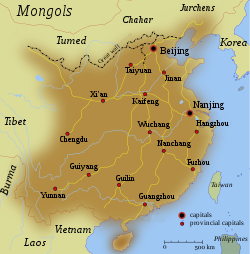 ↑ The capitals-in-exile of the Southern Ming were Nanjing (1644), Fuzhou (1645–46), Guangzhou (1646–47), Zhaoqing (1646–52). ↑ 4.0 4.1 These marks show the tones of the Chinese words, which are important in saying them the right way. ↑ Turchin, Peter; Adams, Jonathan M.; Hall, Thomas D (December 2006). "East-West Orientation of Historical Empires". Journal of world-systems research 12 (2): 219–29. ISSN 1076-156X. Archived from the original on 22 February 2007. https://web.archive.org/web/20070222011511/http://jwsr.ucr.edu/archive/vol12/number2/pdf/jwsr-v12n2-tah.pdf. Retrieved 12 August 2010. ↑ Reischauer, Edwin Oldfather; et al. (1960), A History of East Asian Civilization, Vol. I: East Asia: The Great Tradition, London: Allen & Unwin . This page was last changed on 9 September 2018, at 02:07.